With two of the biggest names in house and techno set to tear up The Baltic Triangle in July, Getintothis’ Ste Knight looks ahead to Noir and Detlef – and a craft ale in the summer sun. Picture the scene – it’s a beautiful hot, hazy summer’s day in mid-July. You notice there’s not a cloud in the sky as you squint against the sun, while the Azores High blows a subtropical breeze against your skin. You’re in your favourite beer garden, drinking your favourite craft beer, you’re with your favourite people while you listen to your favourite house and techno tracks played by a top selector for your listening pleasure…sounds perfect right? Right! 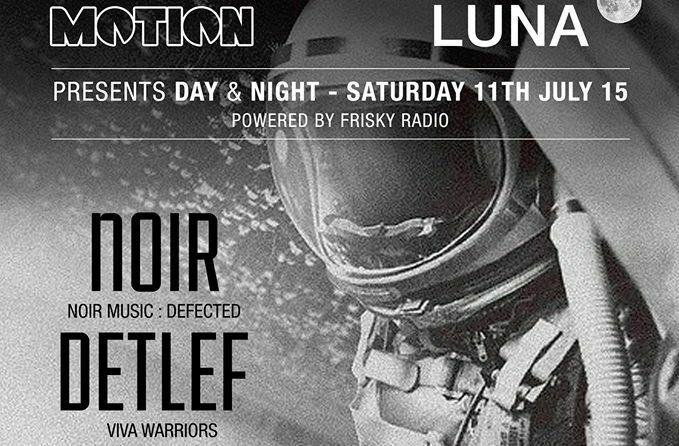 No fear, we’re not trying to hypnotise you – give it until 11 July and all of the above will be happening to you courtesy of the guys at Motion, Luna, Constellations and The Garage at the aptly titled Motion and Luna present Noir and Detlef. The idylic outdoor space, Constellations, over in the Baltic Triangle, is playing host to some magnificent DJs at a summer party with bells on. Fresh on the back of his emotional, summery single Explode, released in collaboration with Chris James on vocal duties, Noir is going to be bringing his peerless brand of energetic house to headline the day’s proceedings. Recently signed to Defected (alongside running his own Noir Music label), Noir has outdone himself on the recent Noir in the House mix. Expect a full on pumping house set from this man. Supporting Noir for the daytime event will be Liverpool icon and all round sonic paragon Derek Kaye; Wirral DJ and producer of Bassheads house screamer Is There Anybody Out There, Desa; Luna rezzie, Lemon Lounge pioneer and all round awesome DJ, Steve Parry; Motion founder and resident, Prudence; and last but certainly by no means least, Djangos House Party. A cracking line-up for the afternoon session. The evening will see us be thrust into the loving arms of The Garage for even more auditory abundance. Prudence and Ste Parry will be legging it over to provide some night-time ready wares in support of second headliner Detlef. Signed in 2010 to Steve Lawler’s label, Viva Music, Detlef is a relative newcomer to the scene. That means nothing, however, because he knows how to throw down an outstanding house set and this is sure to be absolutely no exception. Detlef will be playing a special 3 hour extended set. Tickets are still available for the event so grab them here.